Your invitations acts as an introduction to your guests as to what's in store for them at the baby shower you are hosting. 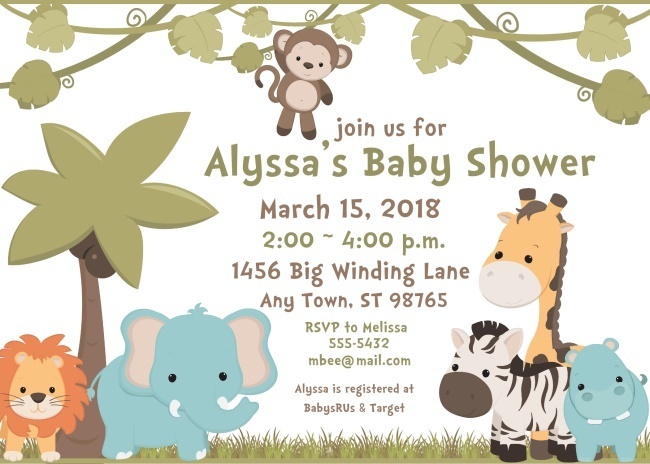 So if it's a jungle or safari themed shower, then our Baby Animals Safari Baby Shower Invitations are the perfect choice! Our talented staff of graphic designers creates each and every invitation and then we have a professional printing company print them using meticulous standards and high quality papers. Your order is professionally printed on premium matte or glossy paper. Proof approval within 2 business days of receipt of your order. Delivery within 2 1/2 weeks of your approval of your proof.